I am so excited to share with you one of the recipes that saved me from eating eggs and bacon for breakfast every day: keto granola. Packed with fiber and only 5g net carbs for half a cup, these crunchy slightly sweet “cereals” are perfect in the morning served with low carb yogurt or unsweetened nut milk. I am not sure you can call it muesli, granola or cereal but it reminds me of the usual healthy breakfast I had each day before going to school. My mom always added nuts & seeds to my cereal bowl because “it helps your brain”. If you have ever read the ingredients lists of the store bought granola or muesli you’ll notice how much sugar it’s in them. 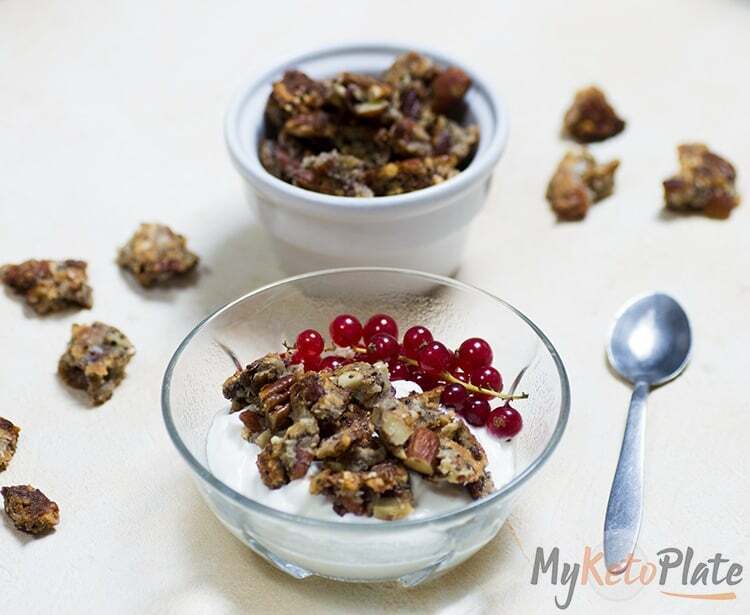 Half a cup of granola has more than 40 grams carbs while this homemade keto granola has only five grams of net carbs for the same quantity. 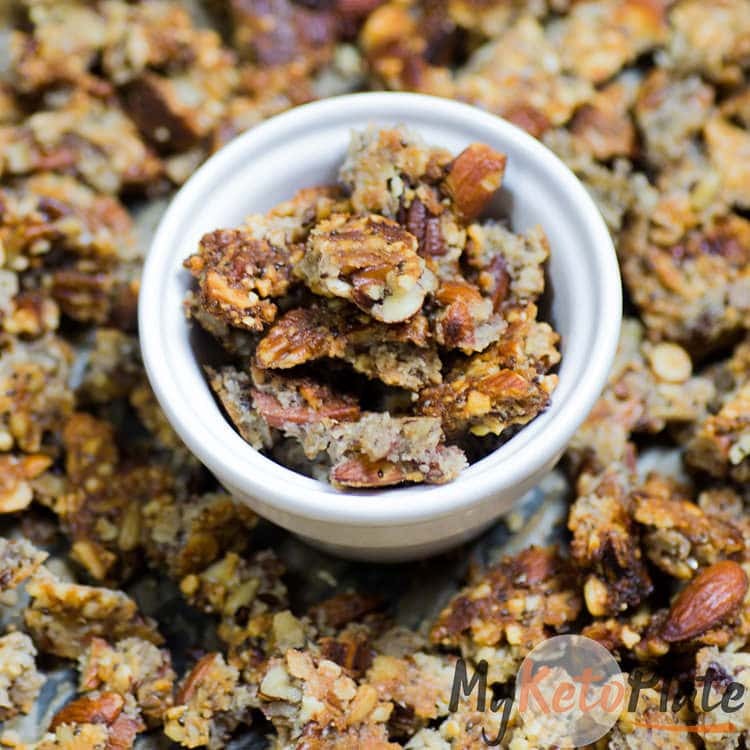 How to make crunchy keto granola? I am always short on time because of my full-time job as a programmer I try to find different ways to reduce the time spent in the kitchen. Chop the nuts in a food processor until they are still chunky, you don’t want a fine powder. 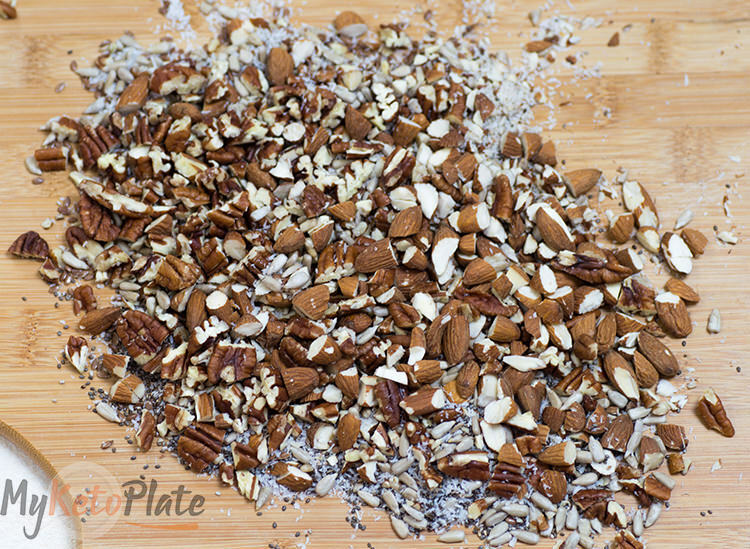 Using your sharp knife cut the nuts into little pieces. Find a large bowl and throw all the ingredients and give them a thorough mix. I used two small eggs but you can use a large one. After you add the coconut oil and the sugar-free syrup you should get a slightly wet mixture. If your “dough” is too wet add some coconut flour to absorb most of the moisture. 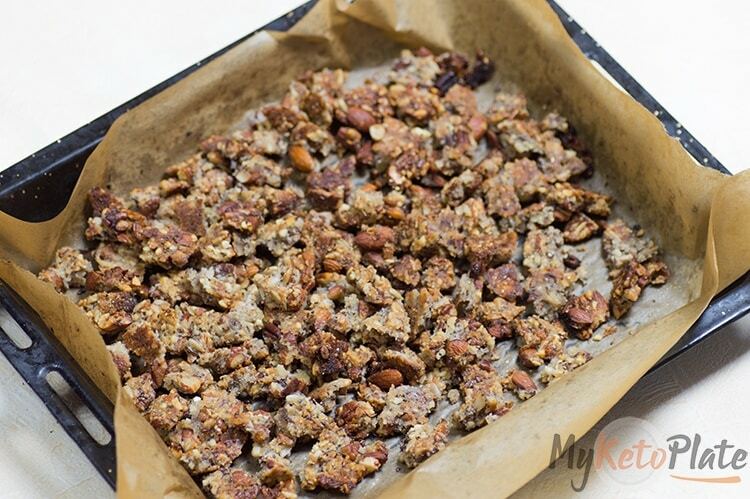 Line a baking sheet with parchment paper and evenly spread the granola like in the picture above. Bake for about 25-30 minutes or until it begins to harden. Once you get it out of the oven allow it to cool down completely. Using your hands break the granola in big chunks. Store the granola in an airtight container for up to one week, in the fridge for two or in the freezer for 2 months. Always keep an eye on the granola because nuts and seeds burn quicker than wheat. You’ll want to make sure that the mixture is cooked in the middle too because the edges burn faster. Keto Granola is the perfect alternative from the classic keto breakfast. Serve it with low carb yogurt and enjoy a filling first meal of the day. 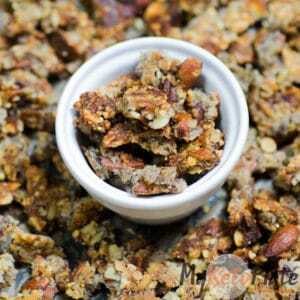 It tastes like real granola, is sweet enough, crunchy and good for meal prep. Preheat your oven to 180C / 355F. Meanwhile, chop all the nuts and seeds into smaller pieces. 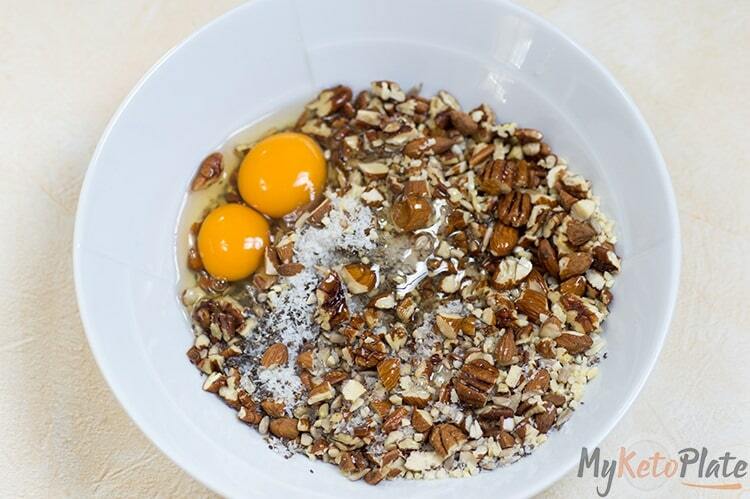 Into a large bowl add the chopped nuts and seeds, the melted coconut oil, sugar-free syrup and the eggs. Mix until all the ingredients are well incorporated. 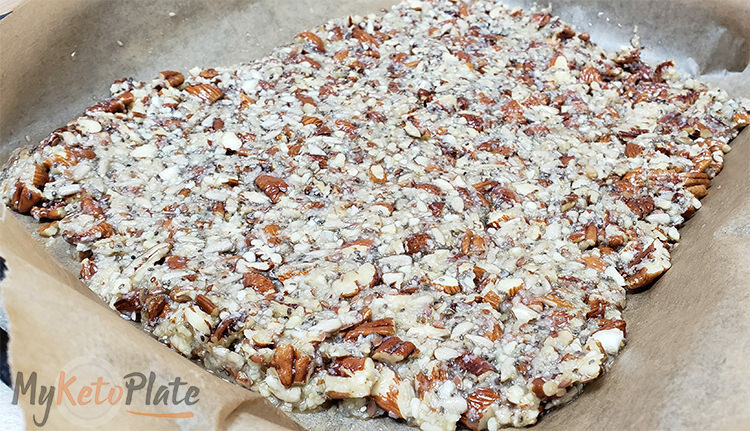 Line a baking tray with parchment paper and place the granola mixture out into a flat even layer. Bake for about 20 minutes, then keep an eye on it for ten more minutes to prevent it from burning. Allow it to cool down entirely then break the keto with your hands into small pieces. Serve it with keto yogurt or with unsweetened milk. Store the keto granola in an airtight container for up to one week. I made this yesterday. I tasted absolutely awesome. Just wants to ask if you could help me work out how many grams would half a cup be? That’s incredible. I’m not sure how many grams are in 1/2 cup but next time I’ll make the recipe I will update the post! !